My tiny baby child boy son was born really really early and it was scary. Scary children need as much help as they can get. Some other children do too. MedEquip4Kids do all kinds of charitable givingy things and help save the lives of all kinds of miniature people in the childlike form (scary or otherwise). 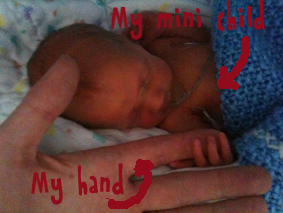 By donating money to this charity of my choice you can help save tiny lives too (like a genuine superhero) and also feel kind of good about yourself at the same time, without having to run really far in the process (I’ll do that bit – 10k/6 miles at the Great Manchester Run, Sunday 15th May). So please give whatever you can afford (no amount is too little) and donate now. (If you don’t then it means you hate children. And you’re evil. And you smell of cabbage and poo pie). P.S. Donating through JustGiving is simple, fast and totally secure. Your details are safe with JustGiving – they’ll never sell them on or send unwanted emails. Once you donate, they’ll send your money directly to the charity and make sure Gift Aid is reclaimed on every eligible donation by a UK taxpayer. So it’s the most efficient way to donate – I raise more, whilst saving time and cutting costs for the charity. Donate here (it’s fast, simple, safe and secure).